If there is one thing I’m certain of, it’s that my palate’s love of creamy pasta is at odds with my stomach’s distaste for both dairy and gluten. Give me a plate of spaghetti boscaiola and I will bloat to button-popping proportions faster than you can say, “where’s the garlic bread?” It’s this sad reality (plus a penchant for finding healthy substitutes for my favourite foods) that encouraged me to spend hours in the kitchen concocting a super-clean alternative to pesto pasta—a beloved indulgence. 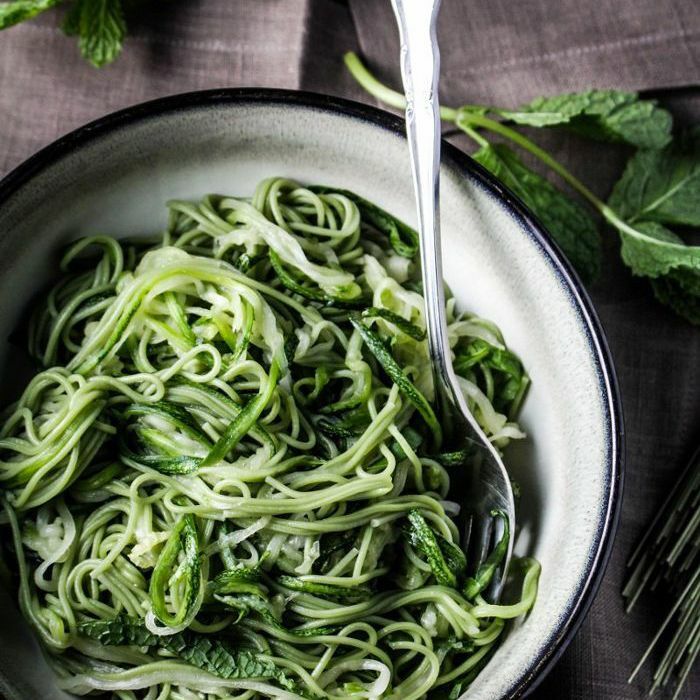 A traditional pesto pasta was once high on my naughty list, but several kitchen experiments (and Pinterest deep dives) led me to discover what I believe is the perfect healthy alternative. It has all the flavour and none of the guilt or bloat. “How is that even possible?” I can almost hear you asking. Well, the secret lies in the addition of a couple of surprising ingredients. By subbing out cream for avocado and a head of broccoli, and replacing gluten-packed pasta with spiralised zucchini, I’ve come up with a delicious mid-week dinner that doesn’t cost a week’s rent in exotic ingredients. Better yet, the addition of vegetables both bulks up the nutritional content of your pasta and adds all-important flavour. Keep scrolling for your new staple weeknight dinner. Chop and steam broccoli until really soft. Let broccoli cool for 5 minutes, then add to food processor with all other ingredients, except pasta. Pulse until smooth and creamy. (Or less, if you’d prefer a chunky sauce.) Add a drizzle of water or oil to help it blend smoothly, if necessary. Boil your pasta as per packet instructions, or, if using zoodles, saute lightly in a frying pan. Add your pasta to sauce, and stir through. Return to stovetop to heat through, if needed. Serve with salt and pepper, and a sprinkle of extra parmesan. Next up: Looking for more zoodle recipes? We love this delicious green tea version from Katie at the Kitchen Door.